By Gene Tunny - posted Wednesday, 16 May 2018 Sign Up for free e-mail updates! One of Queensland Deputy Premier-Treasurer Jackie Trad's biggest challenges in her first state budget, to be delivered next month, is to demonstrate a credible debt reduction strategy. She needs to show how she can reduce state debt from its current level of $71 billion, or at least prevent it from blowing out to nearly $81 billion, as currently projected for 2020-21. In this regard, she will be helped by healthy royalty and payroll tax revenues, but she also has to cope with a fall in Queensland's share of GST revenue and the legacy of the past debt build up, which costs the general government budget $1.5 billion in interest expenses each year. 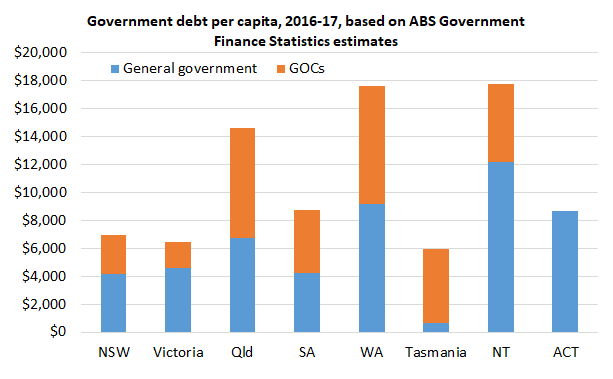 When chatting with people about my forthcoming book Beautiful One Day, Broke the Next, to be published by Connor Court later this year, I am often asked how the state government accumulated so much debt. To answer this question, I analysed the cash flow statements of the Queensland government over 2006-07 to 2015-16, the ten year period in which total state debt increased by over $54 billion. I am looking at the whole Queensland government, including government-owned corporations (GOCs), because it's the total debt figure that the rating agencies such as S&P and Moody's focus on, and also because the lines between the general government sector and GOCs have been blurred in Queensland (see my post Qld state debt debate is challenging for both sides). 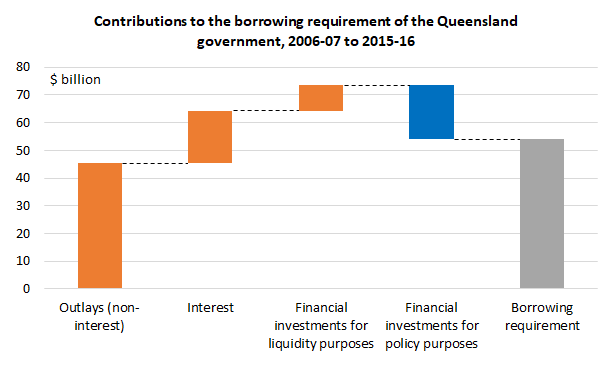 asset sales and leases (which are negative "Financial investments for policy purposes"), largely by the Bligh government in 2010 and 2011, substantially reduced the overall borrowing requirement. I noted above it was additional capital outlays that were to blame. What types of infrastructure were invested in? While the drought resilient infrastructure spending on dams and recycled water and desalination plants are often brought up, they were only a fraction of the total capital outlays over the period. Capital outlays were widely spread-e.g. 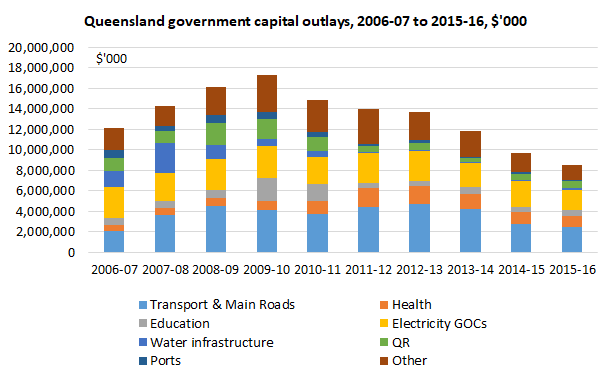 there were large capital outlays on roadworks (see the figure below, based on my collation of data from the Queensland government's capital works statements over the period). I should note the Australian government contributed to the funding of a significant amount of these capital works, e.g. Building the Education Revolution (BER) and natural disaster support, but the huge growth in capital outlays began in the late 2000s, before BER and the 2010-11 natural disasters. Successive Queensland governments implemented policies aimed at raising service levels towards national standards in key areas and addressing infrastructure deficits. The benefit of that investment today (beyond the obvious service delivery benefits) is that Queensland is not facing the major infrastructure pressures now being experienced in many other states. The Treasury also noted the imbalance between Queensland's desire to be a low tax state and the need to provide a decent level of services. While the Treasury made some fair points, it was constrained by the necessity of it being seen as non-partisan, and it could not deliver much deserved criticism of the quality of Queensland government decision making in the mid-to-late 2000s, which is a major theme of my upcoming book. Needless to say, the quality of business case development and decision making in this crisis-prone period was substantially below par. So where are we now? Queensland has a much higher state debt per capita than most other states and territories (see figure below). I am very much looking forward to Deputy Premier-Treasurer Trad's debt reduction strategy in her first state budget. It's not completely out of the question that Queensland could regain a AAA credit rating in the next five years, with strong budget management and with a continuation of favourable economic conditions. We wish the Deputy Premier-Treasurer well in this endeavour. Gene Tunny has 15 years' experience in economics and public policy, as a private sector consultant and state and Commonwealth official, most recently with Commonwealth Treasury.